A humanoid alien, Ki-Adi-Mundi was a well respected member of the Jedi Council. His enlarged conical head, containing a binary brain, made him easy to identify. The Cerean was discovered when he was four years old, by a jedi master known only as the "Dark Woman." His parents then allowed him to travel to Coruscant to begin training to be a jedi. He was first assigned to begin training with Master Yoda. Decades later Ki returned to Cerea to defend it from invaders, and became watchman of the system. Despite being a Jedi, Ki still lived by many Cerean customs, including the polygamous marriage. He had a bond wife, Shea, and four honor wives. He had seven daughters and was a vital community leader of the Cereans. Near the time of the Battle of Naboo, Ki was involved in a politcal struggle people tried to change Cerea's ways of life. His daughter, Sylvn, joined the radicals, thus, putting her life and danger and she was eventually kidnapped. A criminal by the name of Ephant Mon had kidnapped her. Ki tracked him down to Tatooine, and rescued his daughter. In the process, he discovered an involvement of the Trade Federation. Upon returning to Coruscant, he was invited to permanatly join the Jedi Council, and fill an empty space left by the recent death of Micah Giett. Ki-Adi-Mundi later returned to Tatooine, in search for missing Jedi Master Sharad Hett. H found Hett and his son who had been living with Tusken Raiders. Hett was then killed by Aurra Sing, and Ki took Hett's son, A'sharad on as his padawan. When Qui-Gon Jinn reported a sith attack just before the Battle of Naboo, Ki was stunned. He stated, "Impossible, the Sith have been extinct for a millenium." The failure to discover the Sith resulted in the death of jedi Qui-Gon Jinn. Ki-Adi-Mundi traveled to Naboo to attend the funeral, and was also at the celebration after the Battle of Naboo. 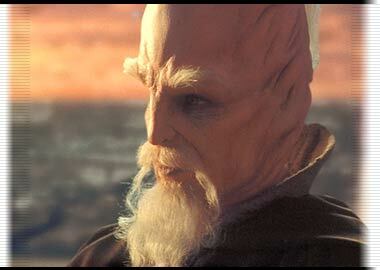 Ten years later, Ki-Adi-Mundi was present during the separatist movement, threatening to split the Republic. Ki-Adi-Mundi was not the only jedi to be mistaken about Dooku. Dooku oversaw the scheduled extecution of Obi-Wan Kenobi, Anakin Skywalker, and Padme Amidala. But the arrival of a Jedi taskforce, including Ki-Adi-Mundi, saved the three from execution. The jedi ended up battling with Geonosians and droid forces of the Confederacy of Independent Systems. They were ready for the Geonosians, but not the droid armies. When Yoda arrived, with Republic reinforcements, Ki-Adi-Mundi hopped onto a Republic Gunship, and then led clone troopers into battle. Although Ki-Adi-Mundi survived that dark day, many jedi did not, sadly.